Designed with convenience and styling in mind, the bold design of the 2019 Civic Hatchback distinguishes itself from other vehicles in the class. The European-inspired suspension delivers a dynamic drive while the hatchback creates the cargo room that adapts to your needs. Fire up the turbocharged engine and take the 18-inch wheels on the Sport Touring trim for a spin. The performance and convenience make the 2019 Honda Civic Hatchback unlike anything else. Drivers will also appreciate that Honda Sensing® comes standard on all trim levels. Visit Premier Honda in New Orleans, Louisiana to find your Civic now! Honda cares about the safety of its drivers. With its high-tech safety features, sleek styling, and premium materials, the new Civic Hatchback quickly sets a place for itself at the table. The Honda Sensing® safety package is a suite of driver-assist technologies designed to help you avoid things you might miss and navigate the unexpected on the roads of Metairie and Kenner. Along with its desirable practicality, the new Civic Hatchback offers a fully-independent multi-link suspension and up to 180 horsepower. If you want to tingle your skin, you want the Sport or Sport Touring trim. If you opt for the Civic LX, EX, or EX-L Navi, you'll still have a turbocharged engine that spits out 174 horsepower. Paddle shifters give you control of the RPMs for quick downshifts and added passing power when you need it. For those of you who like to take control of the gears, row through a six-speed gearbox with the manual transmission standard on the Sport trim. 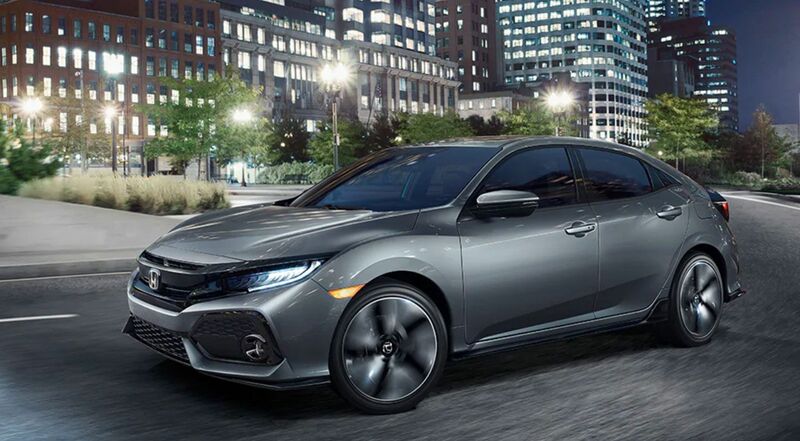 If your Honda lease deal is about to expire, consider this new hatchback for your next car. The 2019 Honda Civic Hatchback is now available at our nearby Honda dealership. Visit Premier Honda for a test drive of the new Civic Hatchback and enjoy the turbocharged performance, connected audio options that include Apple CarPlay™ and Android Auto™, and remote engine start. Don't miss seeing Honda LaneWatch™ that displays live video on your touch-screen of what is next to you. If you want a new hot hatch, you want performance and versatility. The hatchback design and 60/40 split fold-down rear seatback deliver the cargo configurations you need for your next road trip. For added security, the built-in side-pull cargo cover stays out of your way and conceals valuables while blocking any direct sunlight. Along with cargo room, the Civic Hatchback offers seating for five. Pack up. Get in. Head out. The 2019 Civic Hatchback offers a bounty of attractive styling cues as well as accessories. The interior illumination provides subtle mood lighting to your cutting-edge cockpit. Racing-inspired sport pedals are a nod to Honda's racing heritage and finishing touch on the Sport trim. Nobody cares to see wires and cords. Thankfully, this new Honda for sale offers wireless phone charging for compatible devices. Honda believes safety should be standard. Every 2019 Civic Hatchback trim boasts the Honda Sensing® suite of advanced safety features. Discover the sense of security that comes with having Collision Mitigation Braking, Road Departure Mitigation, Lane Keep Assist, and Adaptive Cruise Control, watching out for you and your passengers. Discover more at our new and used Honda dealership near Metairie and Kenner.